The captain needs help navigating the ship! 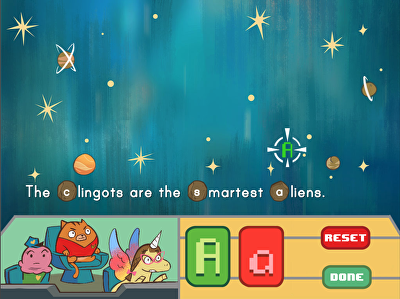 Kids help the crew get through space by capitalizing proper nouns in this fast-paced space-themed game. Kids will practise identifying unique people, places, and organizations in this game's sentences. Soon enough, they'll be flying through space as they pick out proper nouns in all the text they read. Time for an underwater adventure! 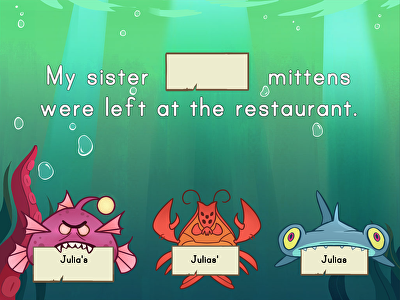 In this game, kids choose the correct possessive noun to complete simple sentences. Some nouns in this game in S, and some are plural nouns, making it trickier than usual! Placing apostrophes in possessive nouns is a tricky skill–kids need to practise often to figure out the rules. Play this game now!